This unique gutter vacuuming and survey system can clear high level gutters without the operators leaving ground level. The powerful, 3 stage, industrial triple motor vacuum makes short work of rain water, moss, soil, weeds and other unwanted debris found in gutters. It is versatile enough to access most areas and powerful enough to lift the heaviest of deposits. The modular composite poles are light and extremely strong allowing us to reach the most difficult of locations. Step 1 Vacuum out heavy debris. Click here to see my vacuuming system working and the view you yourself can see of the problem areas and the final results. Step 2 Flush and wash inside gutters & down pipes. Step 3 View and record results for client with wireless camera. 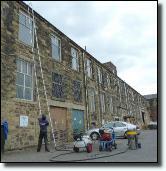 Our property cleaning and property maintenance services cover Lancashire and the North West including Preston, Blackburn, Burnley, Lytham, Chorley, Leyland, Blackpool and all surrounding areas.